Spent Grain – Barley grain that has been germinated to convert energy into starches(malted), and then some combination of kilning, toasting, and drying to specifications needed by brewers to use in their mash, called Malt. For the mash, brewers crush the malt to expose the sugary inside beneath the fibrous barley husk, and add it to water at temperatures carefully controlled to allow enzymes from the malt to convert sugars from the malt into food usable by yeast. The liquid is sent down the line as wort to make beer, leaving the “spent grain“ behind as waste. 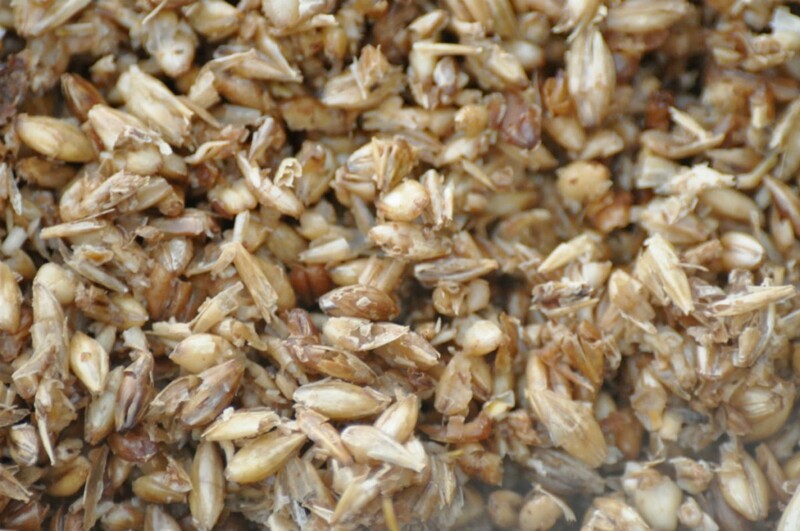 Spent grain is usually recycled as feed for livestock, compost, or use as a hearty and high fiber ingredient in food. Spent grain in cooking primarily contributes a textural aspect. As a dried garnish atop a beef barley soup, it adds a bit of crunch. It adds a chewiness, a touch of roasty nuttiness, and some nice structural and textural changes to a loaf of bread. It can be used in soup or pancakes, ground into flour, used wet or dry, and even incorporated into cookies and pastries. But if we’re going to cook with spent grain, it is important to cook with it safely. Many people are aware of how important sanitation is in brewing. Brewing is is essentially the act of creating a medium ideal for microorganisms and yeast to thrive in. And spent grain is just as nourishing to microorganisms as wort, because it still has wort on the outside, and still has plenty of wet food on the inside. Food safety isn’t rocket science, but it is a matter of proper handling — just like with beer or chicken or lettuce. So, what is safe when cooking with spent grain? The obvious is that you don’t want it to ferment or grow bacteria or mold. But bacteria or fermentation can take hold almost immediately after leaving the hot temperature of the mash tun. So, how much spoilage is safe? Is it okay if you’re going to cook it? Will it contaminate other foods in your home? The basic answer is to either use it immediately after brewing, or prepare it somehow for storage. Of course, many homebrewers will find it inconvenient to brew a batch of beer and then bake some bread on the same day, so finding a way to safely store it away is the best way to hold spent grain for future use. There are a number of ways to prepare spent grain for storage. The most common two are freezing or drying it. Tossing it into the freezer is the safest, easiest way to store grain. It takes no effort to put into storage, but it has the drawback of being a frozen solid block when you wish to use it, and when it thaws it’s still sopping wet. The more labor intensive alternative is to dry the grain. This involves long hours of baking at low temperatures on sheet trays until the grain is dry outside and inside. The drawback here is that it is crispy and dry, and any recipes with an addition of dry grain will need to be adjusted for the water that the grain will — eventually — absorb. This is very undesirable for many styles of bread. The middleground, my personally peferred method for preparation of spent grain as a professional baker, is to dry just the outside of the individual kernels of grain, leaving the inside moist. Conceptually, this prepared spent grain is water-neutral, in that it neither contributes or absorbs a significant percentage of its own mass in water. It can be stored frozen, and still scooped or poured without thawing, and used on a whim. -Drain grain of as much fluid as as you can. -Spread grain in a half inch deep layer in shallow baking pans. -Place into a 350 degree oven for 10-15 minutes, until you no longer hear sizzling on the bottom of the pan. -Remove from oven and stir, stirring the corners to the middle, the outside to the inside. -Return to oven for 7-10 minutes, until the grain no longer feels moist when touched, but still appears to be steaming. -Immediately transfer the grain to a sheet pan and spread into a 1/4 inch layer. Immediately place the sheet pan under the blower vent in your freezer until frozen. Working quickly will insure that the moisture inside of the grain stays there without steaming out onto the surface. -Once frozen, brush off of the pan into a storage container and cover tightly to prevent freezer burn. Keep frozen. The end result can be stored frozen in a bin or bag and used as needed. It should be loose and dry, yet still remain moist inside of individual grains. Frozen shelflife of two to three months. Note: This preparation of spent grain will increase the volume of the grain by roughly 25%. Use 25% more prepared grain than a wet grain recipe specifies, and for loaf style breads add up to an additional ounce of water per cup of grain to compensate. A baker in a brewpub.